The symphony was commissioned and conceived as a millennium celebration work for the Salzburg Festival. My plan has been for the symphony to represent a broad spectrum of many of the world’s great “wisdom” traditions. Working together with the Very Reverend James Parks Morton of the Interfaith Center of New York and Professor Kusumita P. Pedersen of St. Francis College, we synthesized a vocal text that begins before the world’s creation, passes through earthly life and paradise, and closes with a future dedication. We are looking at the moment of the millennium as a bridge between the past (represented by the “Requiem” and embodying the first nine movements up to the moment of Death) the present (the “Bardo” representing the “in between”) and culminating in “Nirmanakaya” (rebirth as manifestation of enlightened activity). We have elected to present the original texts (Greek, Hebrew, Sanskrit, Arabic, Chinese, Japanese and indigenous languages) in one language, English, to show the commonalities with which all these traditions resonate. For a work of this scale it seemed fitting to add chorus, children’s choir and soloists to the usual symphonic ensemble, thereby giving it ample breadth and dramatic capability. Compiled and edited by Philip Glass, James Parks Morton, and Kusumita P. Pedersen. 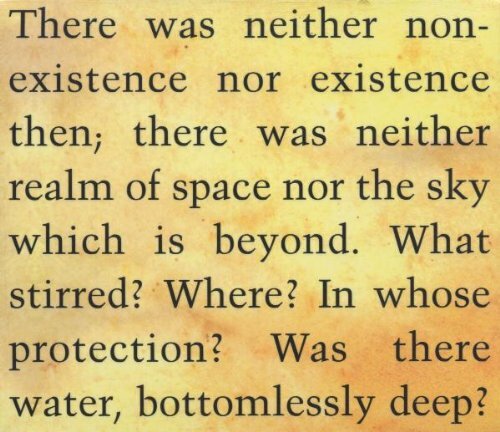 there was neither realm of space nor the sky which is beyond. There was neither death nor immortality [then]. There was no [distinguishing] sign of night nor of day. with no [distinguishing] sign, all this was water. the bond of existence in non-existence. There were seed-placers; there were powers. There was impulse beneath; there was giving-forth above. The gods came afterwards, with the creation of the universe. only he knows – or perhaps he does not know. and groping about found the ocean. and they made Ono-goro-jima the pillar of the center of the land. they went round the pillar separately. they united as husband and wife. the ancestor of the trees, the ancestor of the herbs. the youngest is carried by the current into darkness. Black as night the opaque sea. Still Bumba our Creator was in pain. and the goat named Budi. The creatures themselves then created all the creatures. The goat produced every beast with horns. Yo, the small fish, brought forth all the fish of all the seas and waters. and the iguana made the creatures without horns. Awake, O north wind, and come, O south wind! Vidyãpati says, they are one another. I was thrust to the ground as if by a thunderbolt. is only a breath that is leaving me. It doesn’t matter if you have broken your vows a thousand times. Still come, and yet again come! though they were only works and designs. And so the Bearer, [Begetter,] took back their knowledge. They were blinded as the face of a mirror is breathed on. They could only see clearly close up. with the means of knowing everything. All things, O monks, are on fire. And what are things are on fire? the mind is on fire, thoughts are on fire. The fire of infatuation with birth, old age and death. rise as the enemies of the world for its destruction. and that desire I will fulfill. This wealth is mine, and that also shall be mine. and others I will kill. I enjoy, I am [prosperous], mighty and happy. I am rich, of high birth. Who is equal to me? they fall into loathsome hell. My limbs fail and my mouth is parched. My body is shaken and my hair stands on end. my mind seems to whirl. let the blackness of [the] day terrify it. That night – let thick darkness seize it! I should have slept; then I should have been at rest. when they find the grave? which cannot bear to see the sufferings of others. And place them in happiness. Is the seed of benevolence. To this wide and desolate plain. And quarreling over my bones. And brief as the morning dew. Here in these shadows of grass? Such pains of desire burn my soul! This is my dwelling, the Burning House! how much longer must I carry this body of grief? Leaving all I must depart alone. then a soul shall know its works, the former and the latter. and whoso has done an atom’s weight of evil shall see it. it is not due to anybody else. it is by your own actions. will come now and count out your evil deeds with black pebbles. Then you will be frightened, awed and terrified. but you will not die. Although your body be hacked to pieces, it will live again. and cause great pain and torture. and fear not the Lord of Death. luminous light inseparable from emptiness. The earth’s surface is wasted. There arises a dreadful drought that lasts for a hundred years. Then all these earthly beings perish completely through oppression. Appears as terrifying Shiva and destroys all creatures. Through the sun’s seven rays, he drinks up all the water. and, blazing, ignite all three worlds. These worlds then blaze like a frying pan. All things are consumed by flames. Like elephants they fill up the sky. They completely extinguish this dreadful fire. Overwhelm the entire world with water. Rain pours down for another hundred years. So it is at the end of every Eon. Of wild ducks, geese and swans. Become celestial palaces of worship filled with Buddhas. [From now on] become a playful exchange of flowers. May their going be easy without [any] fatigue. Be guarded by beneficent celestials. [And] of the nature of lapis lazuli. So that harvests may be bountiful. And the people of the world always prosper. And forever engage in virtue. O’Flaherty, Wendy Doniger, trans. “Creation Hymn” (Nasadiya). In The Rig Veda. Penguin Classics, 1981. © 1981 by Wendy Doniger O’Flaherty. Reproduced by permission of Penguin Books Ltd. Pages 25-6. Arberry, A. J. “The Cow.” In The Koran Interpreted, Combined in One Volume. New York: Macmillan, © 1973, 1955. Volume I, page 42. Oxford University Press and Cambridge University Press. The New English Bible. The New Testament, 2nd edition. [First edition 1961; The Old Testament first published 1970.] Reprinted by CollinsWorld. Johnson, Rubellite Kawena, trans. Kumulipo: Hawaiian Hymn of Creation, Volume I. Honolulu: Topgallant Publishing, © 1981. Page 3, slightly adapted. Adapted from Frank Cushing, “Outlines of Zuñi Creation Myths,” Thirteenth Annual Report of the Bureau of American Ethnology, 1896, pages 379-381. As cited in Barbara Sproul, ed. Primal Myths. San Francisco: HarperCollins, © 1979. Pages 285-6. Aston, William George, trans. Nihongi: Chronicles of Japan from the Earliest Times to A. D. 697. London: 1896. As cited in Sources of Japanese Tradition. Volume I. Edited by William Theodore de Bary, Donald Keene, and Ryusaku Tsunoda. New York: Columbia University Press, © 1958. Pages 25-6. Adapted from Adolf N. Krug, “Bulu Tales from Kamerun, West Africa,” Journal of American Folklore, 25 (1912-1913), pages 111-112. As cited in Barbara Sproul, ed. Primal Myths. San Francisco: HarperCollins, © 1979. Page 46. “Bushongo: Bumba Vomits the World,” adapted from Maria Leach, The Beginning. New York: Funk and Wagnalls, 1956, pages 145-147. As cited in Barbara Sproul, ed. Primal Myths. San Francisco: HarperCollins, © 1979. Pages 44-5. Tedlock, Dennis, trans. Popul Vuh: The Definitive Edition of the Mayan Book of Life and the Glories of Gods and Kings. Revised edition. New York: Simon & Schuster, © 1985. Page 145, slightly adapted. Arberry, “El-Hijr,” pages 282-3, slightly adapted. Barks, Coleman with John Moyne. The Essential Rumi. New York: HarperCollins, ©1995. Page 37. Revised Standard Version of the Bible. Division of Christian Education of the National Council of Churches of Christ in the USA, © 1946, 1952, and 1971. Used by permission. All rights reserved. Dimock, Edward C., Jr. and Denise Levertov. In Praise of Krishna: Songs from the Bengali. Garden City, New York: Doubleday, © 1967. Page 15. Barks, Colemen and Michael Green. The Illuminated Rumi. New York: Doubleday, © 1997. Page 3. Warren, Henry Clark, trans. Buddhism in Translations. © 1970 by the President and Fellows of Harvard College. Reprinted by permission of Harvard University Press. The Mahã-Vagga is part of the Vinaya-pitaka. Page 352. Nikhilananda, Swami, trans. The Bhagavad Gitã New York: The Ramakrishna- Vivekananda Center of New York. © 1965 by Swami Nikhilananda. Pages 175-7. Revised Standard Version of the Bible. Nikhilananda, pages 7-8, slightly adapted. Revised Standard Version of the Bible, slightly adapted. Lau, D. C. Mencius. New York: Penguin, © 1970. Page 83, slightly adapted. Batchelor, Stephen. A Guide to the Bodhisattava’s Way of Life (Bodhicaryãvatãra) by Shantideva. Translated from the Tibetan commentary by Thog-me Zang-po. Dharmsala: Library of Tibetan Works and Archives, © 1979. Pages 22-3. Lau, page 83, slightly adapted. Kanze Kiyotsugu Kan’ami. “The Sought-for Grave” (Motomezuka). Translated by Barry Jackman. In Twenty Plays of the Nõ Theater. Edited by Donald Keene. New York: Columbia University Press. Page 45. Ono no Komachi. “In this world” and “How sad.” Translated by Mariko Aratani. In Jane Hirshfield, The Ink Dark Moon: Love Poems by Ono no Komachi and Izumi Shikibu, Women of the Ancient Court of Japan. New York: Vintage Classics, 1990. © 1986 by Jane Hirshfield. Used by permission. Pages 28, 30. Henderson, Harold G. An Introduction to Haiku. © 1958 by Harold G. Henderson. Used by permission of Doubleday, a division of Doubleday Broadway Publishing Group, a division of Random House, Inc. Page 30. Arberry, “The Splitting.” Volume 2, page 328. Ibid., “The Darkening,” page 326. Ibid., “The Earthquake,” page 347. Evans-Wentz, W. Y. The Tibetan Book of the Dead. © 1960 by W. Y. Evans-Wentz. Used by permission of Oxford University Press, Inc. Pages 166-7, slightly adapted. Dimmit, Cornelia and J. A. B. van Buitenen, trans. and ed. Classical Hindu Mythology: A Reader in Sanskrit Puranas. Philadelphia: Temple University Press, ©1978. Pages 41-3. Harvey, Andrew and Anne Baring, ed. The Mystic Vision. Translated by Andrew Harvey. Produced by Godsfield Press, England, for HarperCollins San Francisco, © 1995. Page 158. Tagore, Rabindranath, trans., with Evelyn Underhill. One Hundred Poems of Kabir. New Delhi: MacMillan of India, © 1972 . Pages 25, 24, and 20. Batchelor, pages 25, 184 ff. Original music composed by Philip Glass. Texts compiled and edited by Philip Glass, James Parks Morton, and Kusumita P. Pedersen. Performers: Ana Maria Martinez, soprano. Denyce Graves, mezzo-soprano. Michael Schade, tenor. Eric Owens, baritone. Albert Dohmen, bass-baritone. Vienna Radio Symphony Orchestra. Morgan State University Choir. Dr. Nathan Carter, music director. Hungarian Radio Children’S Choir. Gabriella Thész, music director. Dennis Russell Davies, conductor. Dante Anzolini, assistant conductor. Produced by Michael Riesman and Kurt Munkacsi for Euphorbia Productions, Ltd. Recorded April-May 2000 at the Austrian Broadcasting Studios (ORF), Vienna. Engineer: Anton Reininger. Assistant Engineer: Gerald Ernst. Additional Recording July 2000 at Clinton Studios, New York City, and at The Looking Glass Studios, New York City. Engineer: Dave Winslow. Assistant Engineer: Steef van de Gevel. Assistant Engineers at Clinton Studios: Keith Shortreed, Jeremy Welch. Mixed July 2000 at the Looking Glass Studios, New York City. Engineer: Dave Winslow. Assistant Engineer: Steef van de Gevel. Technical Engineer: Jamie Mereness. Production Coordinator: Kara Bilof. Interns: Mark Agrusti, Greg Blasi, Suzanne Farley, Patrick Inverso, Ken Zimlinghaus. For Nonesuch Records, Production Supervisor: Karina Beznicki. Editorial Coordinator: Gregg Schaufeld. Executive Producer: Robert Hurwitz. This piece was commissioned by Salzburger Festspiele with the support of ASCII- Corporation; world premiere performance August 31, 1999, in Salzburg, Austria, conducted by Dennis Russell Davies. Music published by Dunvagen Music Publishers, Inc., New York City (ASCAP). Denyce Graves appears courtesy of BMG Classics. Thanks to: Jim Keller, Ramona Kirschenman, Danielle Stilli, Hector Castillo, Tim O’Donnell, José Jiménez Mesa, Kerry Egan and Jonah Friedman. A very special thanks to Dr. Andrea Seebohm of the Vienna Radio Symphony Orchestra and Maria Gergely of the Hungarian Radio Children’s Choir. Philip Glass is managed by Dunvagen Music. Nonesuch Records, a Warner Music Group Company, 75 Rockefeller Plaza, New York, N.Y. 10019. © 2000 Nonesuch Records for the United States and WEA International Inc. for the world out side of the United States. All Rights Reserved. Printed in the U.S.A. Warning: Unauthorized reproduction of this recording is prohibited by Federal law and subject to criminal prosecution.